These are pictures of Valve Regulated Lead Acid (VRLA) batteries that were damaged by excessive heat buildup in the battery causing “Thermal Runaway.” The most typical application for VRLA batteries is in Uninterruptible Power Supplies (UPS) which provide an alternate source of energy, using these batteries, in the event of a power outage. 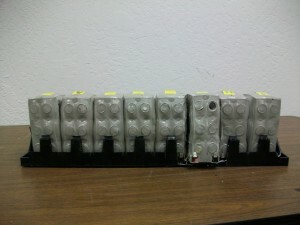 These batteries lost the ability to store current, which causes them to heat up internally. Some batteries became so hot they melted together requiring pry bars and chisels to break the battery free from the tray, rack or cabinet. Thermal Runaway is an abnormal condition where most of the energy provided by the battery charger results in heat generation, in turn releasing energy that further increases the internal temperature of the battery. The elevated battery temperature draws more charging current, causing additional heat build-up. 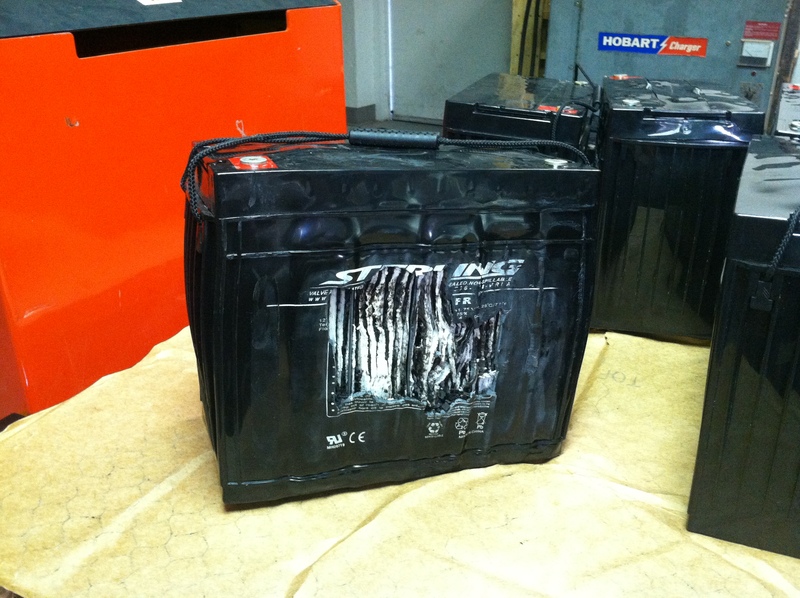 This condition will continue to compound to the point where accelerated dry out and/or melting of the battery will occur and in some extreme cases, cause a fire. -Keep the temperature of the battery environment/room at 77 degrees F as recommended by the battery manufacturer. Every degree above 77 shortens the life of the battery. -Perform battery replacements on aged or failing batteries according to your service provider’s recommendations, battery manufacturer and industry standards. -Perform regularly scheduled preventative maintenance on the UPS and batteries to test impedance, resistance and voltage.As a UPS and battery service provider, we encourage customers to follow these recommendations to ensure the continued integrity and reliability of their backup power systems. As a UPS and battery service provider, we encourage customers to follow these recommendations to ensure the continued integrity and reliability of their backup power systems. This entry was posted in data center maintenance, Uninterruptible Power Supply, UPS Maintenance. Bookmark the permalink.